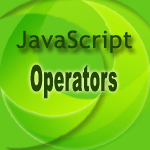 An assignment operator assigns a value to its left operand based on the value of its right operand. The first operand must be a variable and basic assignment operator is equal (=), which assigns the value of its right operand to its left operand. That is, a = b assigns the value of b to a. In addition to the regular assignment operator "=" the other assignment operators are shorthand for standard operations, as shown in the following table. a +=b a = a + b Adds 2 numbers and assigns the result to the first. a -= b a = a - b Subtracts 2 numbers and assigns the result to the first. a *= b a = a*b Multiplies 2 numbers and assigns the result to the first. a /=b a = a/b Divides 2 numbers and assigns the result to the first. a %= b a = a%b Computes the modulus of 2 numbers and assigns the result to the first. a<<=b a = a<<b Performs a left shift and assigns the result to the first operand. a>>=b a = a>>b Performs a sign-propagating right shift and assigns the result to the first operand. a>>>=b a = a>>>b Performs a zero-fill right shift and assigns the result to the first operand. a&= b a = a&b Performs a bitwise AND and assigns the result to the first operand. a^= b a = a^b Performs a bitwise XOR and assigns the result to the first operand. a |=b a = a|b Performs a bitwise OR and assigns the result to the first operand.